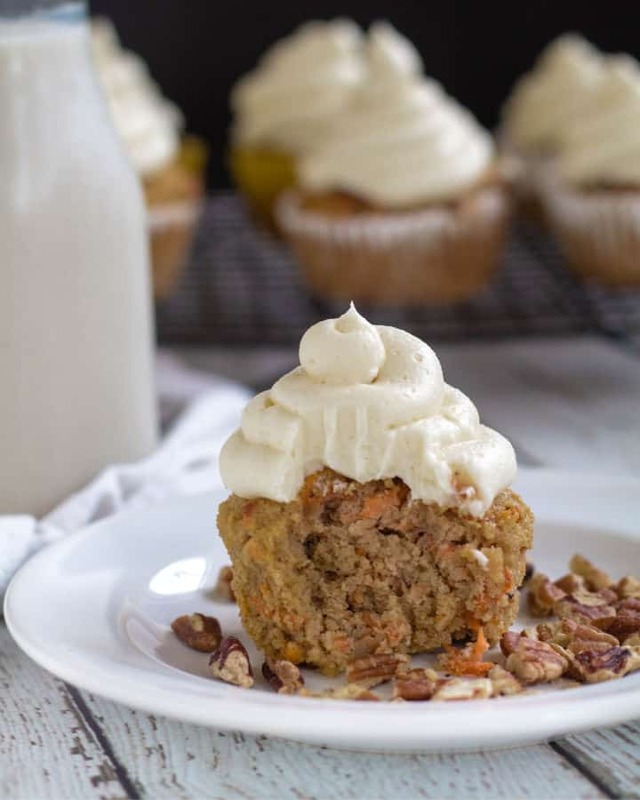 These Paleo And Keto Carrot Cake Cupcakes are the real deal! They’re soft, tender, have a great spice flavor, and are topped with silky keto cream cheese frosting! They are also gluten free, grain free, and can be made dairy free too so everyone in your life can enjoy them. 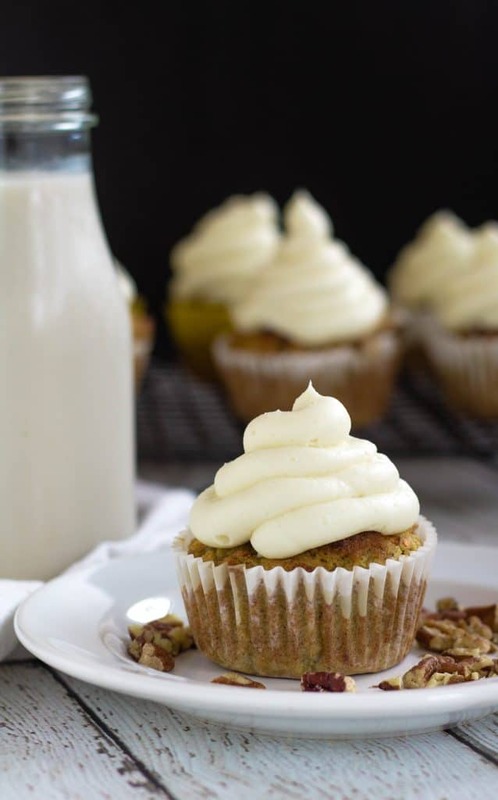 These carrot cake cupcakes are the real deal! They’re soft, tender, have a great spice flavor, and topped with cream cheese frosting! 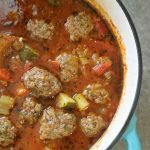 And even though many people think ‘carrots aren’t keto‘ they work fine in this recipe! Yes, carrots are higher in carbs, but in small amounts you can still incorporate them into your diet without ruining it. 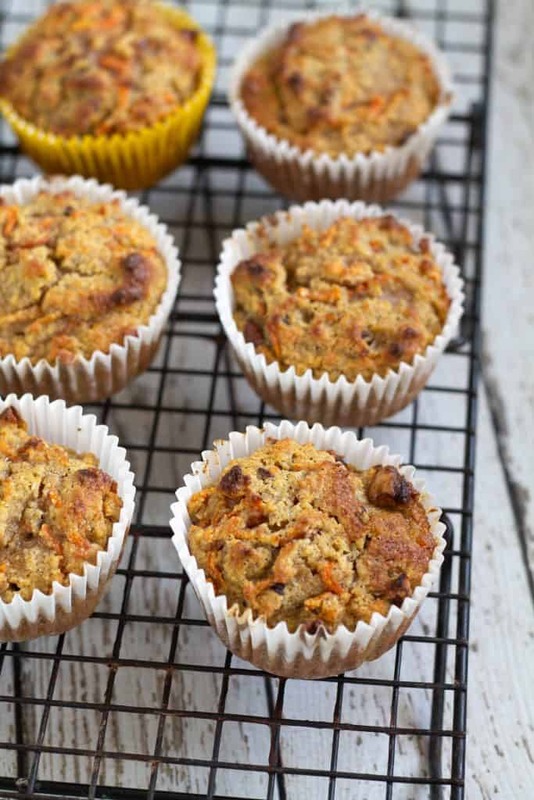 Carrot Cake Cupcakes are fairly easy, but let’s run through it together! Next, you need to grate the carrots. To do this I recommend using the grate attachment on your food processor and then briefly pulsing them in your food processor for finer shreds of carrot. The picture above shows the carrots grated before pulsing in the food processor. While they’re nicely grated and they can certainly be used like this, they’re still just a bit too big. Be careful not to overdo it, though, or you’ll have carrot juice! If you don’t have a food processor, you can use a hand grater to grate them. Don’t be tempted to save time by using pre-shredded carrots at the store, please grate your own! The pre-shredded carrots are often hard and dry. When you grate the carrots at home you’ll notice how wet they are. This is needed moisture so don’t skip it! 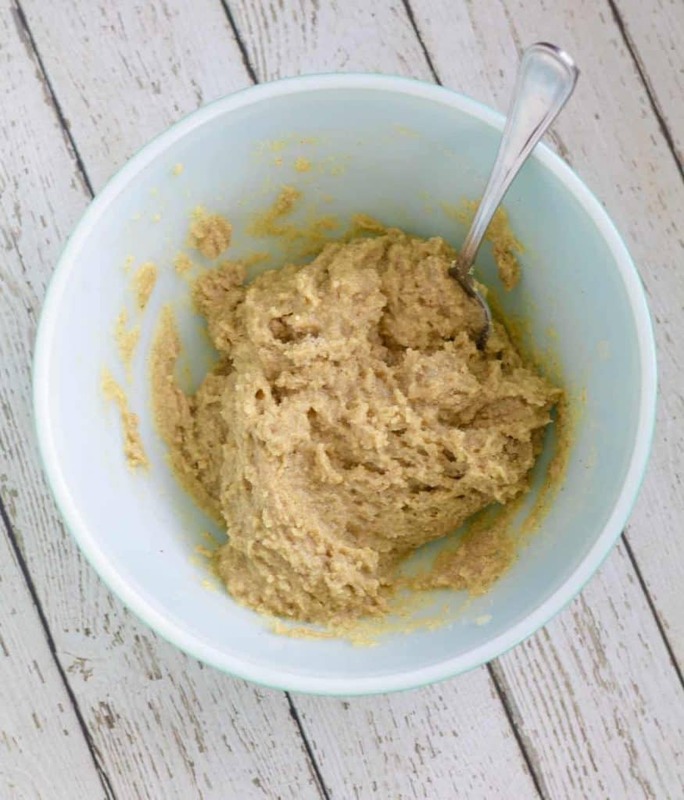 In a large mixing bowl, whisk together some almond flour, sugar of choice, baking soda, baking powder, salt, cinnamon, nutmeg, giner, and a pinch or two of cloves. 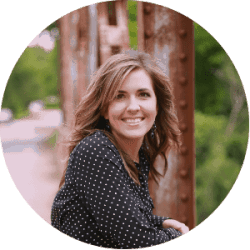 For the sugar, I use either Swerve Granulated Sweetener (affiliate link) or Lakanto Granulated Sweetener because they are Keto friendly. Both brands also have a ‘brown sugar’ version, which I highly recommend. The brown sugar versions add a nice deep flavor that the white versions don’t impart. However, the white variety will still work, as well as sifted coconut palm sugar if you follow more of a Paleo diet. For the spices, I use the traditional cinnamon and nutmeg, but I also add a small amount of cloves and ginger. The cloves and ginger add a nice flavor without being too overpowering. 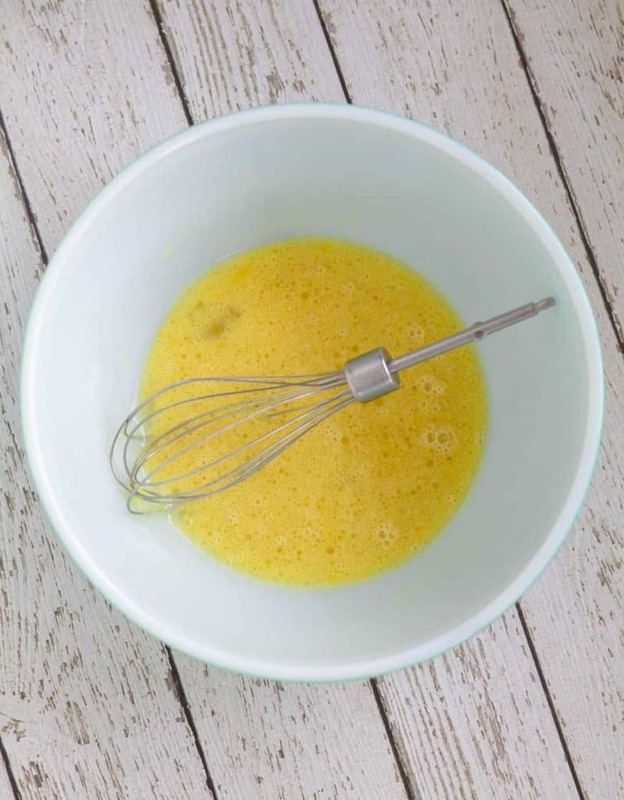 In a separate mixing bowl, whisk together some eggs, avocado oil, and vanilla. Stir the wet ingredients into the dry and, using a rubber spatula or wooden spoon, mix until just combined. Fold in the shredded carrots and pecans. 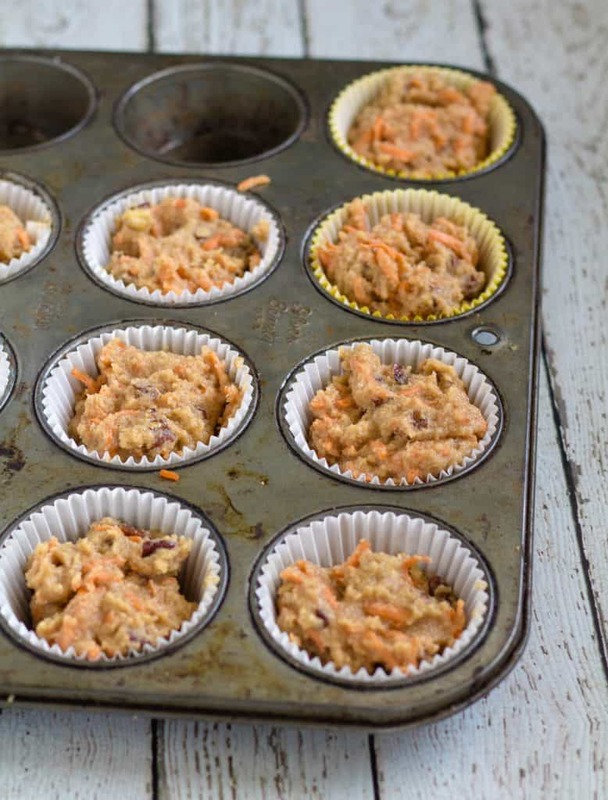 Line a muffin tin with 10 cupcake liners and evenly distribute the batter. Use your fingers or the back of a spoon the smooth out the tops. Bake at 350 degrees for 18-23 minutes, or until the tops are a deep, golden brown and a toothpick inserted into the tops come out clean. If they start to brown too early, cover with aluminum foil. Allow to cool in the pan 10 to 15 minutes, then remove to a cooling rack to cool completely. For the cream cheese frosting, you will beat together 8 oz. of full-fat cream cheese and 1/2 cup of room temperature butter. Be sure that you use a block of cream cheese and not cream cheese spread or the frosting will turn out runny. For the butter, I highly recommend using organic and grass-fed. Not only does it taste 1000 times better, but it packs a nutritional punch that regular butter just doesn’t have. It’s also important that the butter is softened to room temperature. If you don’t have all day to let the butter set on your counter, though, check out this tutorial on How To Soften Butter Quickly from Sally’s Baking Addiction. After you beat together the butter and cream cheese, slowly add in Powdered Swerve Sweetener or Powdered Lakanto Sweetener, a tsp. of pure vanilla, and a pinch of sea salt. Beat until thickened and smooth. Note-If you are dairy free, feel free to use non-dairy butter and non-dairy cream cheese. Just make sure that you like the taste of both as they will determine what the frosting tastes like! You can also check out my other Paleo & Dairy Free Cream Cheese Frosting Recipe that doesn’t use a cream cheese sub. 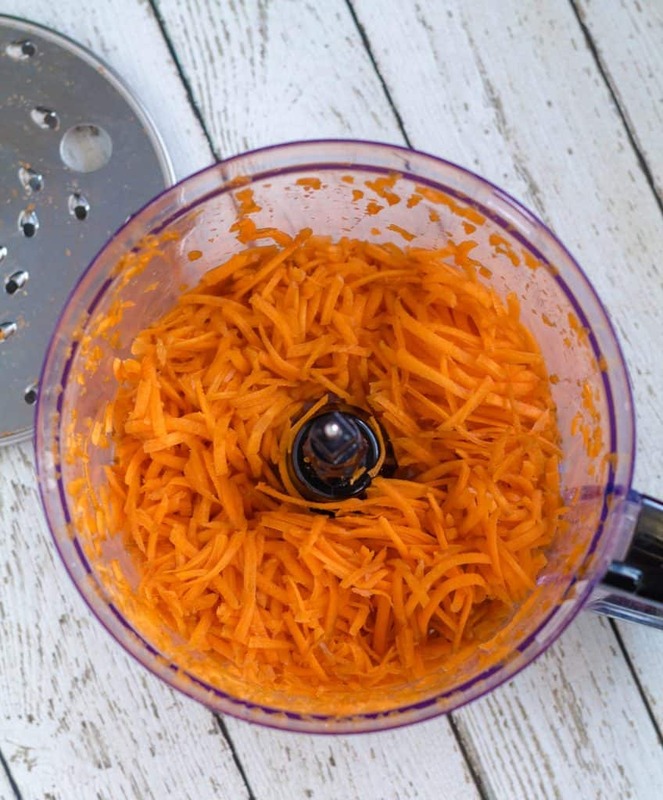 To grate the carrots, I recommend using the grate attachment on your food processor and then briefly pulsing them in your food processor for fine shreds of carrot. If you just grate them, they seem a bit too big. Be careful not to overdo it, though, or you’ll have carrot juice! If you don’t have a food processor, you can use a hand grater to grate them. 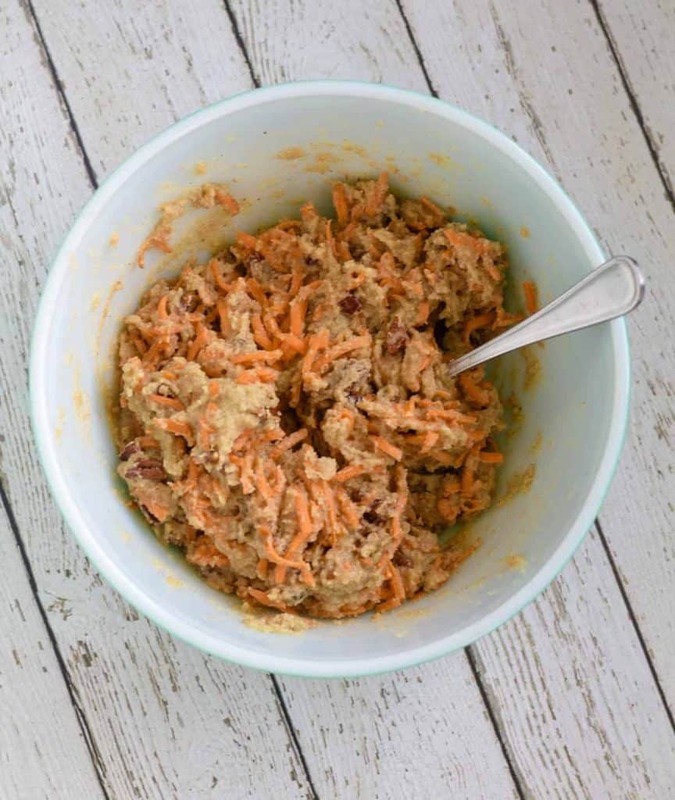 Don’t be tempted to save time using pre-shredded carrots from the store. Please grate your own! The pre-shredded carrots are often hard and dry. When you grate the carrots at home you’ll notice how wet they are. This is needed moisture so don’t skip it! 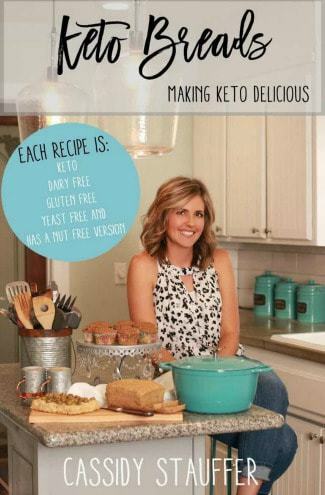 To sweeten the cake I use either Swerve granulated sweetener or Lakanto granulated sweetener because they are Keto friendly. Both brands also have a ‘brown sugar’ version, which I highly recommend. The brown sugar versions add a nice deep flavor that the white versions don’t impart. However, the white variety will still work, as well as sifted coconut palm sugar if you follow more of a Paleo diet. I use the traditional cinnamon and nutmeg, but I also add a small amount of cloves and ginger. The cloves and ginger add a nice flavor without being too overpowering. For the frosting, be sure to use a block of cream cheese and not cream cheese spread, or the frosting will turn out runny. If you are Paleo & Dairy Free, you may also like my Paleo Carrot Cake Cupcakes With “Cream Cheese” Frosting recipe. 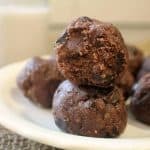 That recipe is sweetened with honey and doesn’t require the use of dairy free cream cheese or butter if you are dairy free. 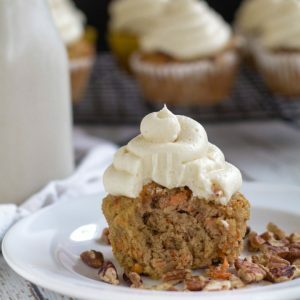 These Paleo And Keto Carrot Cake Cupcakes are the real deal! They're soft, tender, have a great spice flavor, and are topped with silky Keto cream cheese frosting! They are also gluten free, grain free, and can be made dairy free too so everyone in your life can enjoy them. Preheat the oven to 300 degrees. Line a large baking sheet with parchment or a Silpat baking mat. 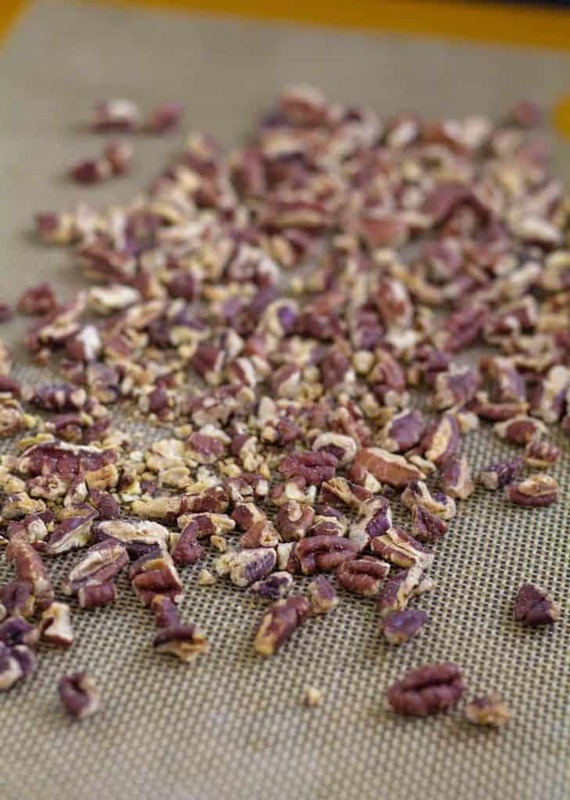 Place the pecans on the baking sheet and toast for 7 to 8 minutes, or until fragrant. Then, set aside to cool. Turn the oven up to 350 degrees and line a muffin tin with 10 cupcake liners. 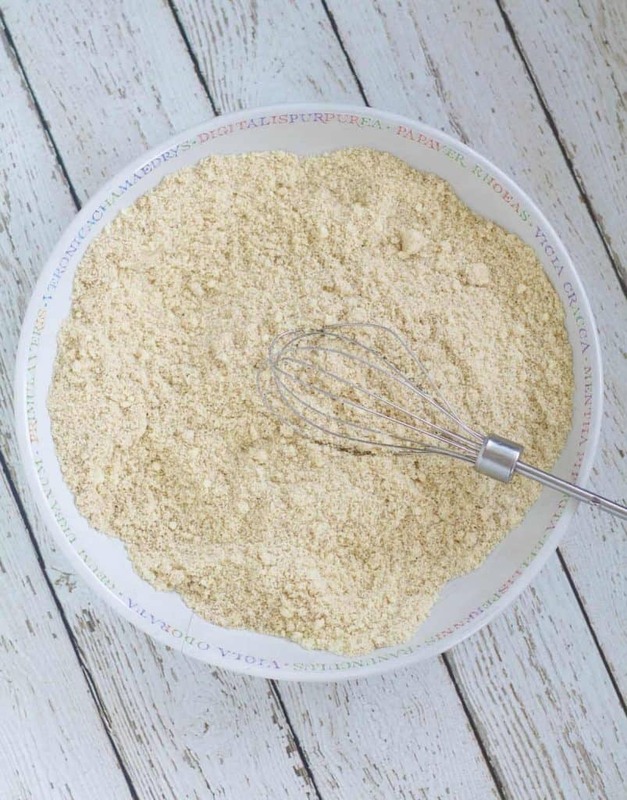 In a large mixing bowl, whisk together the 2 cups almond flour, 1/2 cup sugar of choice, 1/4 tsp. baking soda, 1/2 tsp. baking powder, 1/4 tsp. salt, 3/4 tsp. cinnamon, 1/2 tsp. nutmeg, 1/8 tsp. ground ginger, and 2 pinches of cloves. In a separate mixing bowl, whisk together the 3 eggs, 2 Tbsp. avocado oil, and 1 tsp. pure vanilla. Stir the wet ingredients into the dry and, using a rubber spatula or wooden spoon, mix until just combined. Then stir in the 1 cup of grated carrots and toasted pecans. Evenly distribute the batter between the muffin cups and use your fingers or the back of a spoon the smooth out the tops. Add the room temperature butter and cream cheese to a large bowl and beat with an electric mixer until combined, about 2 minutes. Slowly beat in the confectioners sweetener until thick and creamy, scraping down the bowl as necessary. Beat in the vanilla until incorporated and a pinch of sea salt if it's too sweet.